Today a provincial judge approved an injunction against the Alton Gas water protectors. A group of supporters and allies are holding a fundraiser for their legal defence. Since the fall of 2016, Mik’maq water protectors have been occupying the site of a natural gas storage project on the bank of the Shubenacadie river. The project proposes to dig out large underground caverns, intake 10,000 gallons of water from the river a day and flush out up to 1.3 million cubic metres of salt brine into the partially-fresh water river. Now Alton Gas Storage- the project owner- has tried to push forward by filing a temporary injunction, specifically mentioning two individual water protectors. On March 12th the protectors and Alton Gas had an initial court hearing, where the wording and intent of the injunction was highly questioned. Justice Gerald Moir will be giving his decision on the injunction this Monday, March 18th . Another case for a permanent injunction will be held on April 4th. Support for legal defence will be especially needed. 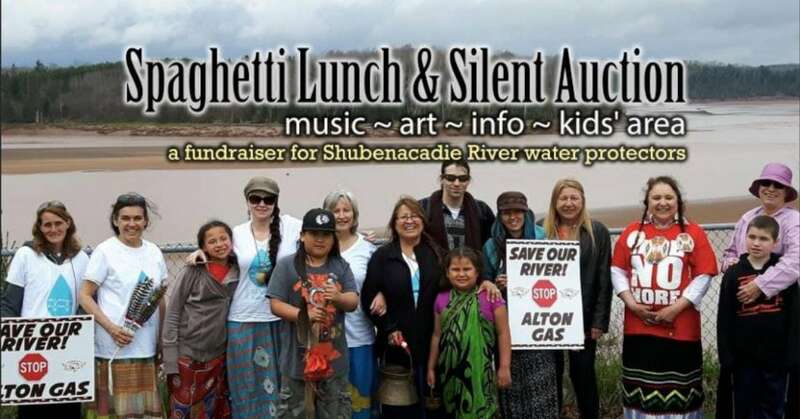 In light of this, supportive community members and allies have organized a delicious spaghetti lunch and silent auction.On Sunday, March 24th from Noon to 3pm, in Maitland, East Hants County, the food will be amazing with gluten-free and vegan options, the auction items will be exciting and the cause will be good.